This built-in hob will give a completely smooth, integrated look to your kitchen worktop, but itâs much more than a style statement. The CH60TX is powerful, easy to control and packed with smart safety features. There are four zones available in two sizes, covering anything from a wide frying pan to a small saucepan. They range from 1.2 kW to 2.1 kW, offering enough power for even the most demanding cooking methods. 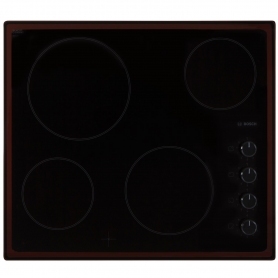 Between them the zones offer complete cooking precision, with a choice of nine power levels each. Spend less time waiting and more time cooking - the hottest setting will take less than a few minutes to be pan-ready. The unique Fastlite design means the cooking zones heat up much more rapidly than in a standard ceramic hob. Bellingâs handy Auto Heat Up feature further minimises the time you spend waiting. It will set to maximum power for a rapid heating boost, before dropping the temperature to the level you need. Â It will even bleep to let you know when your zone is ready. Front mounted touch controls maintain the hobâs sleek surface and mean there arenât any knobs or dials to clean around. They are easily controlled with gentle taps of your fingertips. The digital display clearly shows your temperature settings, which can be altered by selecting the cooking zone and the power level adjust buttons. You can also set a timer which will switch the heat off for you when your back is turned. The touch controls have a key lock safety feature to prevent the kids from changing your temperature settings. If the cook zones are off, this function will lock all of the keys so the hob canât be turned on accidentally. Thereâs a hot hob light which acts as a warning when the surface is dangerous to touch. The automatic shut-off feature will prevent accidents by switching the hob off if itâs been left on for too long without interaction. A built-in hob is the latest style statement in the modern kitchen. The jet black CH60TX looks impressive, and itâs incredibly easy to use. Buy yours here.